NSK-213(4stations or 6 stations) for single manual operation have high mobility and efficient suited for few order, sample and testing mold. The unique design of producing have good cooling system to use materials of foaming and no foaming, when using foaming material let production not change color, not change quality expand the best foaming effect. It is suitable for P.V.C. foaming, T.P.R. and solid P.U. & N.B.R. Photoelectric digit control system with 3 patents divides quantity of materials into four steps to control ejection quantity respectively and precisely. The disc is computer operated to protect the system well especially to the molds. Movement of disc is hydraulic control with hydraulic brakes, enabling stability in the movement and accuracy in positioning. Special hydraulic design with speedy, low electric cost drive by 20HP motor. 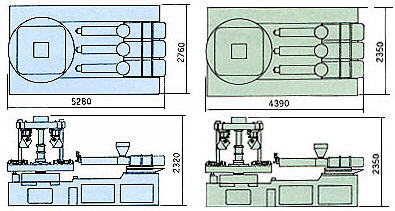 Hydraulic closed mold system with powerful mold locking and would not create fiber trims and permeation of colors. Efficient cooling system has good cooling effect and stable quantity. Cooperate with auto turn Last system, auto clamping system easy to operation and high capacity.